In her view, the resurgence of Southern Racists after the Civil War was caused by mean old Northerners being jerks to the South. If the USA could have just been a little nicer to the traitorous rebellion who armed themselves and attacked the North rather than abide by the results of the election of 1860, then race relations in our country would have been better off. Hillary Clinton is a Confederate Apologist. What Hillary Clinton fails to acknowledge here is amazing and telling. White southerners took up arms against our country, against our government, and against Democracy and killed millions of people to defend their economic reliance on slavery. After the military defeat and surrender, the South wanted to go right back to the way things used to be, despite having lost the war. The Republican congress and Army were left to enforce the victory of the USA against the traitors. This took a massive expansion of the Federal Government, the creation of the Justice department, the passing of new laws and Amendments to the Constitution, and the use of the US Army. If Lincoln had lived, this program of Reconstruction would have most likely been more aggressive. Lincoln was set to remake the south and bring them back into the USA, with civil rights for Black people enshrined in law. Lincoln may have been magnanimous in victory, but we will never know because when he began to lay out his agenda for such a program, he was killed by a white supremacist conspiracy. How would civil rights and equal justice under law have been enforced without these massive federal programs, troops, and laws? Magic? All we have to do is look at what happened when the northern troops were removed from the south. The KKK was allowed to terrorize black people, black politicians were run out of office, lynchings were reinstated and many other terrors were visited on southern blacks. Poll taxes, literacy tests, and every other trick in the book was rolled out by the white elites to reduce or eliminate black political participation. It took almost 90 more years to start to unwind this damage, and it continues on to this day. You would only have to look at the recent history, with states coming out from under the Voting Rights act mandatory approval of new laws, with states like Texas passing new voting restrictions just hours after the lifting of the law. The point is, Hillary Clinton does not think that state power should be used to advance the rights of minorities, or other groups, because it would not be “forgiving”… Does Hillary Clinton even support civil rights in 2016? Who would her pick to head the Justice Department be, and would she prioritize expanding the voting rights of black people in the south? If her view of history is that the Federal Government caused Jim Crow and not southern racists, would she even use the power of the Government to assist in enforcing justice? Most of all, if Hillary Clinton thinks that, why do black voters support her so much in the polls? In 2002, Sanders gave a speech about the vote for the war in Iraq. He says that extremists in the area could overthrow regional powers and destabilize the Middle East. There are a lot of theories on the GWB Closing scandal, as to why this happened? It seems pretty straight forward that this happened because of political retribution, but what version of political retribution? A Failure to endorse Christie, a development deal that stepped on toes, event appointments to the NJ State Supreme Court have been put forward as theories. Failing actual responses to the subpoenas, right now, all we have are theories, so here is a new one: Sokolich had a beef with the Port Authority Police Department, and the lane closure was retribution. The alarm bell for me was the testimony of Bill Baroni. Comparable to Colin Powell’s UN Presentation in a level of total B.S. the most telling moment was when he was asked about the planning of the “traffic study”. When asked who he spoke with about this, the first person he sights is Paul Nunziato chairman of the police union, and the second person is Michael DeFillipis, delegate who worked on the bridge. Let’s be clear, these are the UNION LEADERSHIP, not leadership within the structure of the actual police department. Doesn’t it seem a little irregular that when questioned about where the idea for the “traffic study” came from, that no member of the actual power structure of the PA could be sighted, and instead two members of the police union are sighted? At any rate, compare the testimony of Baroni with the stories coming out from the time of the Port Authority police blaming Sokolich, telling motorists to “call the mayor” and this looks sketchier and sketchier. Now let’s add in the fact that the PA police union was one of the first labor endorsers of Christie in the 2012 election, and that because of the actions of Christie, the PA hired hundreds of more police officers at great public expense and this puts a whole new spin on the story. So, here is a new theory, based totally on speculation. Mayor Sokolich was fighting the PA over what police would be used to patrol an area of Ft Lee, possibly even the new development at the base of the bridge, and Sokolich picked local law enforcement over the PA Police that Christie, Baroni, Wildstein etc. wanted him to use. This means less jobs for the PA Police Dept, which is bad for the PA Police Union, so the President and the Shop Steward of the PA PBA contact Baroni, Wildstein and Christie to pressure Sokolich to change his decision. Sokolich stands firm, and doesn’t change his mind. Arms are twisted, meetings are had, and Sokolich is still stubborn. Threats are made that Ft Lee will lose its local access lanes if Sokolich does not comply. A public narrative is developed that brands the access lanes on the bridge as “Ft Lee only” and that they are undeserving of these precious access lanes as a community. State Senator Kevin O’Toole is used to make the case publicly, and Baroni and Christie stand by this in their public statements at different times. When Sokolich doesn’t change his mind, in order to pay back friends and political endorsers Christie’s team unleashes “Traffic Problems in Ft Lee” aimed at “That little Serbian” as Wildstein put it continuing to use the Port Authority as a patronage mill with both the stick and the carrot. The Port Authority police officers know that this dispute is over jobs for them and are in on it from the beginning. They are told, probably by Nunziato and leadership of the PA PBA to explain to citizens that this is the Mayor’s fault. It is assumed that if enough people call and bother him, that he will again change his mind and to help create even more jobs for Port Authority Police patrolling New Jersey. Then, the whole thing gets shut down by Patrick Foye, and Sokolich outlasts them, either through dumb luck or guile, its hard to say. Sokolich’s comments the first night the scandal in January were all over the place, and it sounds like he probably pissed off Christie in a bunch of different ways, and he can’t quite figure out which one of them caused the retribution. This is my current working theory. It sets off alarm bells anytime a Republican is asked why they did something, and they refer to the advice of a labor union. Its highly irregular that the leadership of a union’s opinion would take the place of the leadership of the actual organization that they work in; no one asks the forklift operator’s opinion when doing a work rule study, they just ask the foreman. With today’s news that Nuziato is “stepping aside” while the scandal is ongoing, its only a matter of time before another layer of this onion is peeled back. People will ask, Why can’t we have nuclear weapons since Israel has them? What is a reasonable answer to that question? 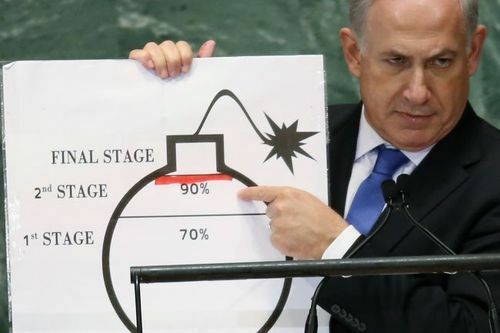 While calling on Iran to abandon it’s Nuclear Ambitions, Netanyahu will not acknowledge Israel’s nuclear reality. The US relationship with Iran is complicated leading back to the US support for the overthrown of the elected government of Iran and the installation of a Dictator aka the Shah, the US support of Saddam Hussein in the Iran vs Iraq war, and of course after 9-11, with the invasion of the neighboring countries of Afghanistan and Iraq. Recent overtures of a limited peace seem shocking, but based on recent reports on the Iranian regional influence, a sensible picture is taking shape. Iran has come to the table now for two reasons: the international sanctions put in place against Iran are crippling its economy and Iran has made a strategic decision that regional influence is more important than nuclear weapons… for now. Starting with the latter point, for some time, countries have followed a tried and true method to ward off a US invasion: get nuclear weapons. This is the Path that Iran has flirted with for some time, with limited success. But, in recent times, with the US invasion of two neighboring countries, Iran has decided that friendly neighbors are more important than nuclear weapons. Starting in Afghanistan, Iran tried to play nice with the US in the beginning, coordinating attacks on the Taliban (also Iranian enemies) and providing intelligence. After Bush’s Axis of Evil speech, that stopped. In Iraq, Iran saw a strategic, political opportunity to influence the politics with resources and military assets, guiding the Shi’ite majority in the country to political power with the Sunni strongman and his power base evicted. Now an Iranian friendly, Shia majority holds political power in a country where that was unthinkable a decade ago. This policy continues now, with Syria. When it finally looked as though the Iranian ally Assad would possibly be overthrown (most likely by Sunni supported forces) the Grand Ayatollah decided that this could not happen, and that they would fully support the crumbling regime with resources, and military assets in the form of Hezbollah fighters. Just one problem here: all of these operations cost money, a lot of money. Estimates of Iran’s support for Assad are in the $600-700 Million dollars per month range, meanwhile Hezbollah’s world wide operations only bring in about $1-2 Billion per year. Iran’s economy, meanwhile, is reliant on oil, which is becoming more and more difficult to export due to US /EU sanctions. Before the fiscal pressures of support and funding a war in neighboring countries, Iran already has having trouble. Now it is approaching a critical choice: abandon Assad, cut supply lines to Lebanon,and hope for the best, or get the sanctions lifted and get some cash coming in. So, enter new Iranian President Hassan Rouhani. He understands this situation and he would like to make the best of it. Surrender Nuclear weapons in exchange for lifting of sanctions, so that Iran can continue to be a Shia focused counterweight to Saudi Arabia in the region. With more resources at their disposal through international trade, Rouhani and Grand Ayatollah Ali Khamenei, the Hezbollah commander Sayyed Hassan Nasrallah, the Iranian commander of the Quds Force Qassem Suleimani would continue their support for Assad, the Shia in Lebanon and Iraq. While it appears that the US Sanctions are having one desired effect, the possible abandonment of the pursuit of Nuclear Weapons, any agreement along these lines could lead the US to deliver a victory to Assad’s forces in Syria, and continue Iran’s expanding influence in the region. I don’t envy the Obama administration in its choices here, but the removal of nuclear weapons from the world is a very tempting carrot which may be met with the stick of an even more powerful regional Iran. Savings accounts for workers seem like a good idea. Can’t other states do this as well?